NOTE: Unfortunately, as of Winter 2014, Mizuwari Soho has been shut down. We will miss it dearly. Mizuwari is a gem. 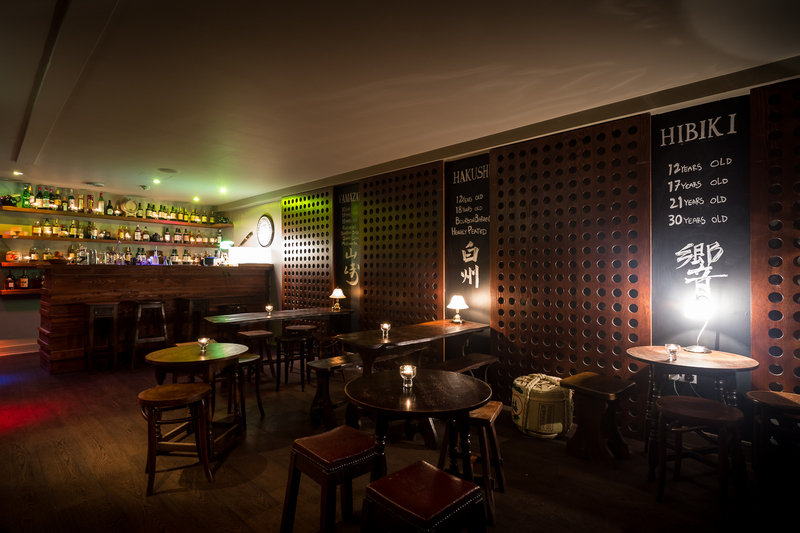 It has certain drawbacks, but it is unique in London as a bar specializing entirely in Japanese whisky – an ignored market here. Old Compton Street’s Bincho is clouded in smoke and vapour from the open kitchen where diners feast as you move to the end of the restaurant and take the stairs down into the self-described ‘dive bar’. This is kind of where the only problem I find with Mizuwari lies. The room is far too dark to read the menu, the television is highly unnecessary, and the furniture incredibly uncomfortable. Considering how low the seats are, and the sense of wanting to lie back and relax with the strong drinks, the backlessness of the chairs is such a major pain. 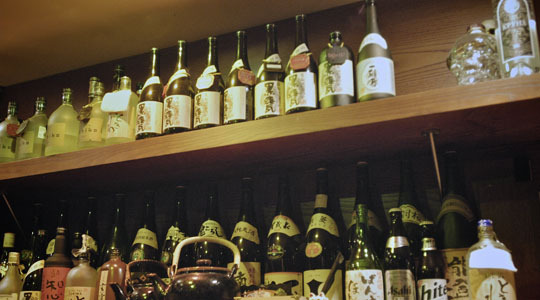 Seated, the incredibly knowledgeable bartender will walk you through the major whiskies they provide, from the well-known Suntory: Yamazaki, to the various Nikka, Ichiro and Karuizawa on offer. ‘Mizuwari’ means ‘mixed with water’, the traditional way to serve whisky in Japan – so we began with the Yamazaki 12 single malt Mizuwari, and the Hakushu 12 single malt with soda, each with crystal-clear hand-cut ice blocks of binchotan charcoal filtered water. Being new to the Mizuwari serve, the charcoal filtered water provided us with a novel new way to explore the flavours of whisky as the water rounds out and dissects the layers of taste for inspection. Among the group, we did see that Japanese whisky may not be for everyone, but it is easy enough a taste to acquire if you already have one for Scotch. We followed with the whisky cocktails. The Hoodooist went for the Risshun – the Hibiki 12 blend whisky, honey Umeshu plum liqueur and ginger. Sharp on the nose, and slightly intimidating; the Risshun is strong, and doesn’t kid around, but has an unmistakable air of sophistication and wit to it. The Umeshu helps soothe the sharpness of the Hibiki 12, and the ginger to bring back its tartness. Conversely, the Shosho (Hakushu 12, soda, rose water and fresh mint), is a fresh, crisp libation for the early evening. Bar snacks include edamame beans on the house, and yakitori skewers to order. Other than the flawed furniture choices and the perpetually sticky floor, the impeccable service of Mizuwari always makes it a perfect destination for the whisky-fan. Of course, the absence of cocktails with other spirits means that you don’t want to bring anyone without a palette for whisky, so do make sure before booking. Even though it’s not on the menu, I’m sure you can request plum wines and sake instead.